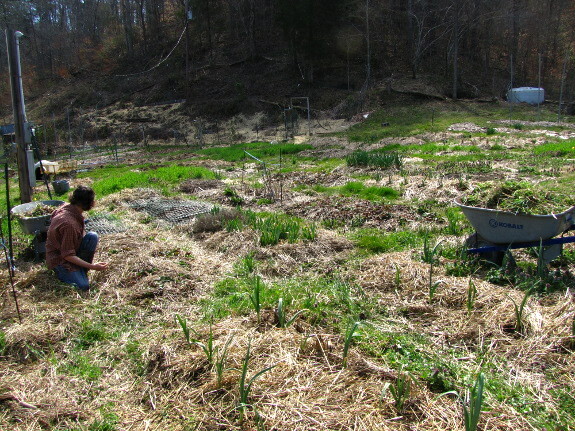 Of course, the arrival of warm weather also means the weeds are starting to grow a mile a minute. Although quite pretty, I'm sure the dead nettle and chickweed choking out my garlic plants were depriving the vegetables of much-needed nutrients. So I roped B.J. into helping me weed, and we made short work of about a third of the front garden beds. And, look, the tree flowers are finally opening! 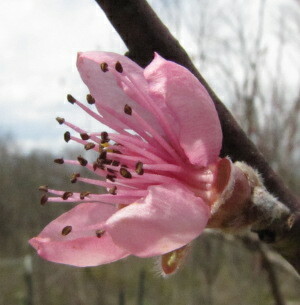 Nanking cherries and sporadic buds on the peaches have unfurled, but the main event is still a few days off. I'm reveling in barefoot weather, listening to toads trilling at night, and dreaming of SPRING! Our chicken waterer is perfect for chickens, ducks, turkeys, and more. I know what you mean. My gardens are coming to live with vigor in the past couple of days. This is the 3 season for my red rasberrys. I have new shoots coming up 2 to 3 feet away from the main branch. These shoots are about 6" high. I want to start a new raspberry bed with these new shoots. Can I transplant them now? Mona --- Those shoots are how we turned one plant into two rows (and a lot of gifts to friends). I usually transplant them in the winter when they're dormant, but you can probably get away with transplanting them now if you give them a little extra water for the next few weeks. Hard to have spring enthusiasm when you are buried under 20 inches of new snow... nearly 15 hours of daylight per day still won't thaw my Alaska beds, but I must trust in the inevitability of Spring as I await my own raspberries (fingers crossed this nasty winter didn't nip them)! This Alaskan doesn't begrudge anyone warmth - happy growing in barefeet!